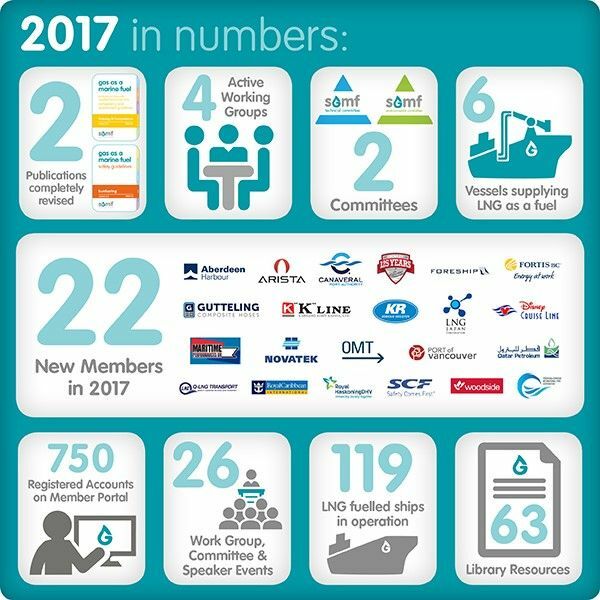 There have already been many significant, positive announcements for the gas-fuelled shipping industry this year, and as we enter our fourth year of operation, I'm delighted to state that SGMF is in a robust and well-established position to deal with the expected surge in activity we anticipate, moving into 2018. 2017 has also seen a leap in membership uptake, and we welcomed 22 new members over the past 10 months alone. This is surely indicative of the benefits that membership brings, but moreover it highlights the clear and robust argument in favour of Natural Gas as we all move towards a more sustainable future. Thanks to the diligent and committed work from the members and the Secretariat, much of the groundwork in the areas of Safety and Technical operational matters are now settled, with many of those best practices and guidelines being widely adopted and accepted by both National Authorities and Regulatory Authorities. Notable achievements have been the Training and Competence Guidelines in 2017 and the QCDC delivered to ISO in the middle of the year. Applying the "80/20 rule", we believe the 20% that remains to be done is going to be the efficient development of SGMF guidelines as more and more operational experience is gained, with so many projects now being ordered and delivered. Our portal was completely overhauled in 2017 and now up and running very well – but there will always be a place for an old school newsletter, too, so please do look out for these every now and then. During 2017, we have held three board meetings; one Technical Committee, plus three regional forums as well as numerous working groups throughout the year. We finally commenced the Environmental Committee with meetings in Rotterdam and Jacksonville, and in particular it is hoped the emerging suppliers group and engine group will quickly develop the environmental positions for the Society. I have been asked many times recently; "when will be the tipping point for gas-fuelled shipping?" and I believe that in the future when we look back there won’t have been any specific moment we can point to. What I do think there will have been is an entire year – and that "tipping year" is surely going to be 2018. We have witnessed such significant increase in the number of projects and infrastructure recently and this is undoubtedly something we can all further look forward to as the greater maritime industry begins to embrace our message and realise the tremendous benefits of gas-fuelled shipping. Lastly, we are delighted to announce we have a new employee joining the SGMF Team in February 2018. You will have a chance to meet Gianpaolo Benedetti, Senior Technical Advisor, at SGMF meetings and events next year. I wish you all a Happy Holiday season.